Schneider: "The world loves Obama. But does the world love the United States?" (CNN) -- Has the new president turned around America's image in other countries? You could call it step one, with many more to go. Then-candidate Barack Obama gave a major speech in Berlin, Germany, in July of 2008. In 2004, President Bush visited Canada and faced massive protests and shouts of "George Bush go home!" But on Thursday, President Obama got a different reception when he crossed the northern border: adoring throngs of Canadians shouting, "Yes we can!" The new president vowed during the campaign to remake the image of the United States in the world. 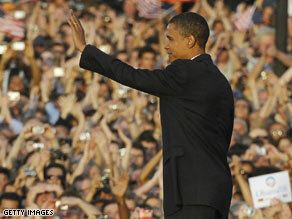 Last summer, for example, candidate Obama traveled to Europe and addressed thousands in Berlin, Germany. "In Europe, the view that America is part of what has gone wrong in the world rather than a force to help make it right has become all too common," Obama said when he spoke not far from what was once the Berlin Wall. But the public relations blitz that began during the campaign won't be limited to Europe in the Obama administration, as Secretary of State Hillary Clinton demonstrated when she traveled to Southeast Asia this week. A survey released by the Pew Global Attitudes Project in December indicates that between 2002 and 2008, favorable opinion of the United States declined in 14 out of the 19 countries polled. In Indonesia, where Clinton visited Wednesday and where Obama spent part of his childhood, favorable opinion of the United States plummeted from 61 percent to just 37 percent. Americans appear confident that world opinion can change under the new president. Last year, when Bush was president, only 24 percent of Americans believed world leaders respected the U.S. president, according to a recent Gallup poll. Now that Obama is in office, two-thirds of Americans believe the president is respected by world leaders. But Americans don't think global attitudes toward the United States have shifted significantly. Just 45 percent of Americans now believe the country rates favorably in the eyes of the world, Gallup found. That's only two points higher than last year. The biggest change so far? Closing the detention center at Guantanamo Bay, Cuba. More changes have been promised. "This is the moment we must help answer the call for a new dawn in the Middle East," Obama said in Berlin. He also promised action on climate change. "This is the moment when we must come together to save this planet," he said in the same speech. Canada -- where on Thursday Obama made his first foreign trip as president -- is one country where opinion may be shifting in America's favor. Just 36 percent of Canadians say their country's relationship with the United States has been good during the last couple of years, according to a recent Canadian Press/Harris-Decima survey. But more than twice that many -- 74 percent -- expect relations to be good in coming years. However, there are some thorny problems ahead for the two countries, particularly regarding Afghanistan. Obama has announced he will send an additional 17,000 U.S. troops to that country. But when Canadians were asked about extending their own troops' mission in Afghanistan, they were opposed by nearly 2 to 1. The world loves Obama. But does the world love the United States? That relationship still needs some work.